Bernard Haitink led the BSO last night in vigorous, crystal clear and captivating readings of two Vienna symphonies, Schubert’s Fifth and Mahler’s Fourth. Both works represent a return to a smaller, simpler form immediately following a larger work, and in both the spirit of Mozart comes through. Haitink’s rigorous focus on achieving maximum transparency brought out all of the youthful excitement of the Schubert and all of the inventiveness and depth of the Mahler. The evening started with Schubert’s Symphony No. 5 in B-flat Major composed in 1816 when Schubert was not yet 20. A tribute to Mozart (and to Haydn) it lends itself to two very different readings. If it is performed with serene objectivity it sounds like Mozart (Harnoncourt for example). If it is inflected with emotion and moodiness, it is more personal and sounds like the future Schubert (the famous Beecham recording for example). Haitink surprised and thrilled by giving it youthful energy, sturm und drang, and a sense that all beauty is ephemeral and must be grasped and savored before it is swept away. After some initial roughness in the strings, the first movement Allegro quickly became expansive, tender and passionate. Haitink emphasized the exquisite finesse and inner correspondences of the sonata form, yet managed to convey both the invincible and vulnerable quality of youth. The second movement Andante was to my mind the highlight of the piece, with the haunting flute of Elizabeth Ostling and just the right feeling of angst. The Menuetto emerged with a powerful resolve in which youthful decisiveness to grasp life was countered by questioning shadows. The Trio was a pleasing moment of Romantic communion with Nature and inner resources of well-being. The rapid final movement, Allegro Vivace, closed the symphony in a temporal rush, reminding us that “we live in the flicker.” With delightful leggiero strings, Haitink exploited its sonorous, sweeping sense of wonder and urgency. The second half of the program was devoted to Mahler’s Fourth Symphony. Mahler refused to provide any programmatic clues to his Fourth Symphony, upset that his previous descriptions had only provided more ammunition to his critics in their attacks. Yet Mahler did leave a hint in a comment he made to Natalie Bauer-Lechner: “The first begins, characteristically enough, with the bells of the Fool’s Cap.” Employing a wonderful transparency, Haitink gave the first movement the character of a Menippean satire, with rapid changes in style and viewpoint. Each return of the Jester’s bells marked another stage in the journey to strangeness, increasingly raucous, unfamiliar, disconcerting, and ending with a need to confront the inadequacy of a purely Earthly life. In the Scherzo concertmaster Elita Kang picked up a mistuned violin to lead a seductive Todtentanz. At the heart of this marvelous scherzo is Mahler’s insight that Death yearns for us like a lover and that we, too, secretly desire it. The effect of acknowledging our problematic fusion with Death was to purge us and liberate us. The ensuing Adagio emerged as a hymn, becoming a cosmic music of the spheres led by a celestial solo from cellist Jules Eskin. Haitink’s avoidance of sentimentality made this metaphysical reading credible, so that the mystical crescendos and the struggle to live beyond the flesh culminated in the great apotheosis near the end of the movement in a convincing manner that few conductors have attained. The finale, sung by soprano Camilla Tilling, provided the key to Mahler’s narrative with the poem, “Das Himmlische Leben,” which presents a child’s view of life in heaven. In a subtle move, Tilling dressed in black and brown, interpreting herself as one of the instruments of the orchestra. She made audible the source of the human drama we had just been led through. Indeed the problem of the child’s view of heaven is that it innocently co-mingles the Heavenly and the Earthly, as attested by the periodic interruption of the sweet poem by the harsh, jagged Jester’s bells from the orchestra. The child will have to become the Jester and confront the pain of daily life with resourcefulness before acknowledging Death and acceding to a mature understanding of Heaven. As Mahler put it, the blue of the sky is there all along, and our quest is to learn to trust it. Really too bad BH is 84, as he got such inordinately lovely and musical results tonight (Sat) in this concert. Tilling was all that as well. I heard the concert on April 30 – it was wonderful. And Ms. Tilling has a gorgeous voice and wonderful interpretive skills expressed through an exquisite technique. All the text could be heard clearly even at the back of the hall in her full range. The stillness and ‘centeredness’ of the singing was remarkable. I hope she is able to return to Boston perhaps performing a recital in the future. On Saturday, I found that Ms. Tilling was covered up by the orchestra from time to time. I had the same experience (in similar seats) for Anne Sofie von Otter for Mahler 3, so perhaps the problem is that my seats don’t favor the voice. On the whole, I found this performance excellent, and I especially appreciated how Haitink patiently sculpted the slow movements. 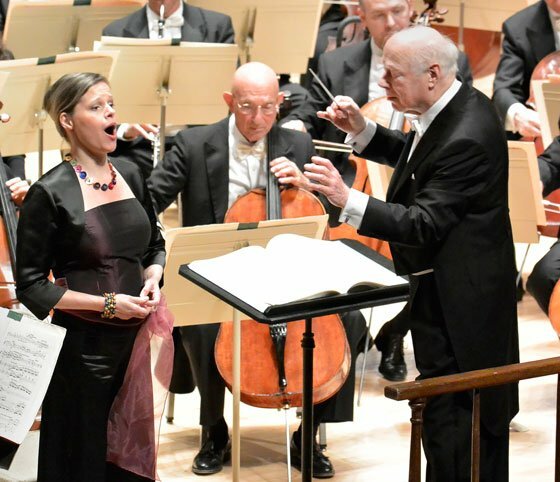 However, I didn’t come out of the hall feeling quite as energized as I had for the last performance of Mahler 4 at Symphony Hall, with Levine and Renee Fleming. As for the rest, there is so much complexity in the orchestration that it can seem like a few dozen Webern symphonies back to back. That aspect didn’t especially shine on Saturday. Everyone was playing well, but somehow the weirder sounds and transitions didn’t always click into place. That’s life. It was still an honest performance, with the right intent and expression. I heard this on WAMC last night. While the Schubert 5 was one of the finest performances I have ever heard of this work and from Haitin, the Mahler was a letdown after the one I personally attened exactly ten years ago. I drove out from Albany on the final Tuesday night repetition and thought that M4 was superb — with a wonderfully quiet Symphony Hall audience to boot. One of my great SH memories, while this one was lethargic in the outer movements. Haitink is indeed aging.